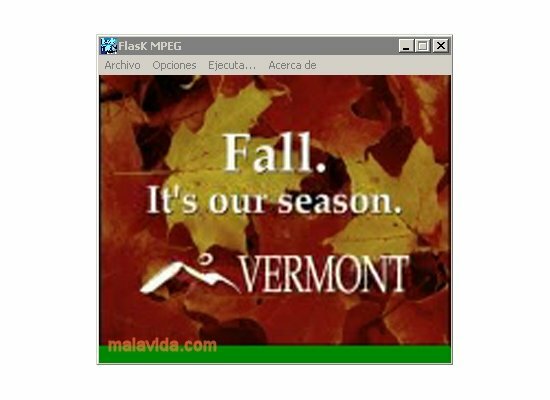 FlasKMPEG is a lightweight utility specially designed to convert files that are coded in the MPEG1 and MPEG2 video formats to AVI, thus increasing the files video compression without hardly losing any quality. Due to the latter is it a very good option to take into account when making backups of your original DVDs, once you have already extracted their contents by means of another applications like DVD Shrink. - Video player integrated into the application. - Video file converter from MPEG1 and MPEG2 format to AVI. - Compatible with DVD IFO files. - Select the video and audio codec to be used to compress the video. - Configure the resolution, the fps rate, the sound mode, the post-processing options, etc. The quality of the final video will depend on the codecs that you have installed in your computer, because to carry out the conversion, FlasKMPEG uses the preinstalled codecs.